ISLAMABAD: It is a joint responsibility of every citizens from all walks of life to safeguard the ecology of Pakistan. We all unanimously must aim to sustainable manage priority forest ecosystem in order to benefit bio-diversity and encourage plantation of indigenous species which would eventually result in addressing the issues of pollution, climate change and deforestation. Community awareness and inculcation of civic sense is the need of time. This was said by the President Sardar Group of Companies and ex-Minister for Food, Agriculture and P&D, Sardar Tanveer Ilyas Khan at the closing Ceremony of Tree Plantation Campaign at Parade Ground Islamabad by the Centaurus Mall. The Ceremony was attended by the notables and veterans of the society. President Chamber of Commerce & Industry Sheikh Amir Waheed, Chaudhary Naseer, President Maroof International Hospital, Veteran Businessman and Social Figure Mr. Sakhawat and notables from civil, Military and Government department attended the Ceremony. 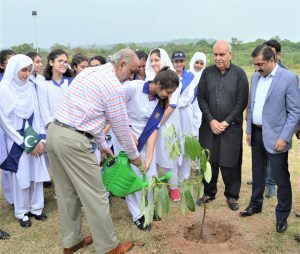 The Centaurus Mall Islamabad initiated a drive of Green Pakistan under a phased programme where 8,000.00 trees have been planted at different locations of the city to include Faisal Mosque, Hill View Park, International Islamic University, Police Headquarters and Parade Ground Islamabad. While apprising the august forum, he said that Pakistan is among the top ten countries at present most affected by the climate change and the simplest way to address it is to increase the forest cover of our country. He further sensitized the participants that in 2015, almost 60,000.00 Pakistanis died from the high level of fine particulate matter in the air making it to be the highest death tolls in the world from air pollution according to the World Health Organization (WHO). We now cannot have a blind eye on it. We owe it to our future generation, he said not all is lost and we must focus on this important aspect of tree plantation in order to ensure that the natural carbon dioxide is absorbed alongwith large quantities of fine particulate matter released into the air. He further added that if such drive is followed by others, it will make a great difference. The Minister separately informed that Pakistan losses an average of approximately 43,000.00 hectares of forests equivalent to half the size of Islamabad every year and with only 2% forest cover remaining, the country’s deforestation rate continues to be the highest in Asia and hence warrants immediate attention. The Centaurus Mall has taken an initiative which must continue and others must follow the footsteps. At the end, he thanked the participants and all stake holders for collaborating in this noble cause and vowed that hands in hands, we will InShaAllah make a difference. The participants also profoundly thanked Sardar Tanveer Ilyas Khan for his vision of Green Pakistan and appreciated the efforts put in by him in personal capacity to make Pakistan green and protect our ecosystem in order to ensure that people live in harmony with nature.